Watching this one the other evening on ITV4. Near the end of the episode the two heavies go into the house to evict the young family and Terry goes in after them. Whilst Terry is making his way through the house, he gets out a cigarette lighter to help him see where he's going. As a non smoker, why would Terry be carrying a lighter? Good point BTB...never thought about this before...perhaps a back up for Arthur, but yes, seems strange! Probably the Director suggested it for tension etc. cant remember any other ep where Terry lights up? Watched this on Monday, quite a good episode with lots going on. Terry's bird in this episode is a bit tasty, a quick IMDB check appears to show she married Nick Mason, of Pink Floyd fame, lucky guy. Anyway, a nice episode with lots of faces appearing in it, Arthur from On The Buses, Simon Cadell, Toyah and Tony Osoba, to name just. Good old Terry saving the day for the couple with the kid living in the squat and also for sorting out the two posh chaps who were getting a bit out of hand in the kitchen. One bad part of this episode was being reminded of coloured bathroom suites, yuk! My first flat had an advocado bathroom suite in it which still gives me nightmares. 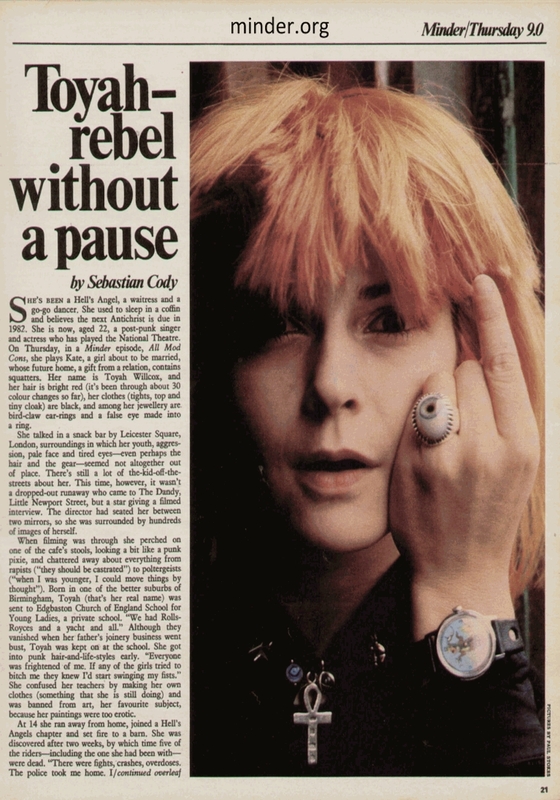 A related TV Times feature on this one, all about Toyah Wilcox from 1st - 7th November 1980. Apologies for the size, any smaller it would be unreadable. Great story about Johnny telling her off. I've still got some of her early albums and singles somewhere - Ieya, Sheep Farming in Barnet etc. It's pretty vicious isn't it and, as you say realistic. Terry gives out some real hammer blows and he looks like a true fighter rather than merely a lump who slogs away. I agree that it's one of Terrys best confrontations, in fact this one and the fight in Dermots garage (Get Daley) are my all time favourites. "It's been average meeting you Mr. Daley" Great line. There's a lot going on in this episode. Arthur is juggling a lot of dodgyness in this one! Terry charging to the rescue is a great moment for the character and the fight with the two goons is well staged. Good solid episode. As the guys say above, the fight scenes here are very good indeed. Another solid 4/5. Decent script & cast. Loved the Space Invaders moment at the beginning! Great & some familiar locations. Picked out some great moments,too! I like this one and it's one I remember seeing at the time of original transmission, mainly because of the spanking Terry hands out at the end. It benefits from having a decent back story as well, something I've mentioned was lacking in some episodes in this series like The Beer Hunter and Not A Bad Lad, Dad. When Arthur approaches the Roller towards the end, Kate obviously puts the window up and it's up during the journey as you can see the light reflecting off it but when he's dumped at the roadside the window is already down. It seems a bit lame to put the window down just so she can trap his tie in it when she didn't want him in the car in the first place. She could've done that when he first approached them! I'm sure this has been mentioned before but watching this online the picture quality is so much better so why are the transmission prints so poor? As I've been watching the daily ITV4 repeats of late, I think I'll stream them from now on and AirPlay them to my TV as they look so much better. A great episode & I have to agree , two of the greatest punch ups , both with the "hooray Henrys "
Michael Robbins "medallion man" image when he arrived with his "niece" was hilarious - Olive wouldn't have approved !! Arthur s tie becomes untrapped from the window of the Rolls , far too easily !!! A few things spring to mind which might explain why Terry, a non smoker, had a lighter handy. I seem to recall that Terry actually says that he doesn't smoke in "An Officer and a Car Salesman". A friend of mine who always carried a lighter in her handbag but who didn't smoke said that you should always have the means to make fire (although how often that was actually necessary in North London i wouldn't like to speculate)... In a similar vein I knew a Slovakian girl once who was a smoker and was forever rummaging in her bag for a lighter. Once she said to me "the average Slovakian woman has four lighters in her handbag..and that's just the ones who don't smoke!" When I was in the sixth form in the late 1980s it was not uncommon for some of the non-smoking boys to carry lighters. Apart from a few budding arsonists the prime reason seemed to be that the vast majority of the girls (who were significantly outnumbered at my school) were smokers and therefore the opportunity to offer an attractive girl a light was seen as a potential route to a date (or possibly detention depending upon where and when...) I have absolutely no idea how successful this strategy was but maybe Terry had a similar idea. Some very good points there gra, all spot on. I think you could well be right about the truck. I think it's a Fiat or Maigrus, neither of which were common in this country during this era. I think your last point would probably be best suited to Terry carrying a lighter larch. It's a nice episode in my opinion. Feels very 70's to me with the setting of the abandoned house and the story within it. Like The Warriors movie gone domestic. They really made good use of it. Can anyone possibly identify the song played when Terry's driving the Capri? 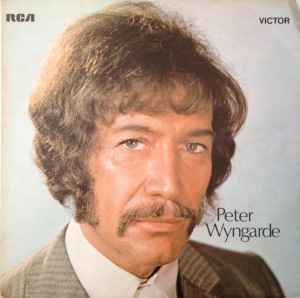 Classic Minder at its best..Micheal Robbins impression of Tom Jones (medallion man) was worlds apart from his On The Buses days. I am always surprised that he was chosen to play such a role to be honest. As you say, being so well known as plain old Arthur, he wouldn't instantly spring to mind when someone was required to portray a 'Daddy Cool' type character. This is a very good episode. Lots of good parts, I like the bit with the Space Invaders at the start. 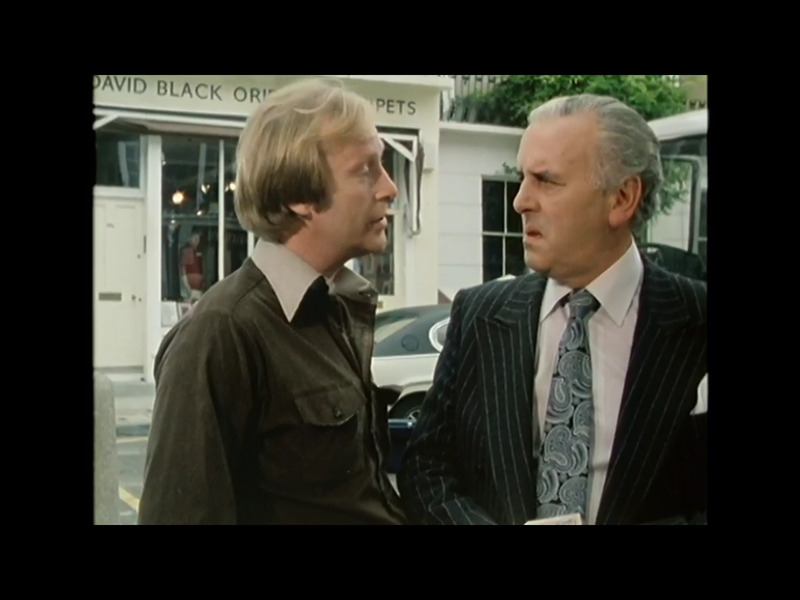 Some good performances too from visitors like Michael Robbins, Harry Towb, Simon Cadell (who I first remember watching in 'Enemy at the Door', I thought he was very good in that). I've never been a big fan of Toyah Wilcox but she is good in this. A very well crafted episode. Presumably this is the only appearance of Helen which seems a shame. 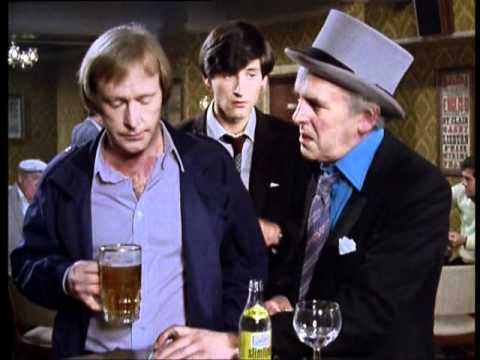 I like it when Jacko brings his 'niece' Shirley into the Winchester, introduces her and immediately she says hello to Dave by name. Dave says to him "I didn't know the pair of you was...related". Very funny. Presumably this is the only appearance of Helen which seems a shame. It would have been good to see Helen appear again. Alternatively, perhaps Debbie or Penny could have taken Helens role because they'd moved on from stripping and air hostessing. Watched this on Monday, quite a good episode with lots going on. 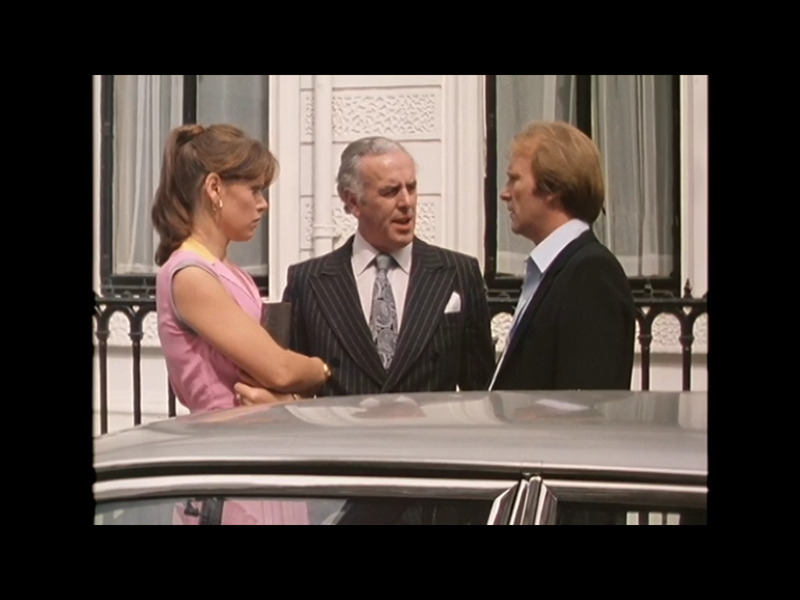 Three separate storylines - Terry's Flat, the old house and the posh club, all intertwined seamlessly. Plus you've got the scenes in the two boozers, the Winchester with Dave and what could be its alternative universe counterpart The Bricklayers with Harry. The eviction sub-plot seems topical even today, what with the gentrification of London and its ever exploding property values. Always been a bit ambivalent about Toyah in this episode but on the latest viewing I think she's actually quite good. Her performance is full of barely suppressed greed - there's maybe something of King Lear's evil daughters about her in the way she fawns over her grandad while simultaneously looking to make a bundle by flogging his house. Didn't know Helen in this ended up marrying Nick Mason of Pink Floyd. She was very tasty in this episode although Terry wasn't going to put up with her nagging him about his lifestyle at this point. Some day I'll get to throw that one in somewhere meself. 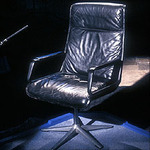 This is an excellent episode, well-crafted, with some interesting characters, best of which is Michael Robbins (his usual professional performance) as Jacko, an experienced and cunning haggler - notice how he knows in advance exactly how much key-money he's going to pay and how he then unloads a consignment of useless bathroom goods onto Arthur for £400 - "if you pay me in cash!" Jacko is obviously an inveterate womaniser - who else would dare to wear that appalling medallion in public or allow his latest conquest to call him "Jackie-Poo" in front of his mates?